Edition c.25, NYC FAP WPA. Signed and titled in pencil. Image size 8 1/8 X 10 inches (206 x 254 mm); sheet size 11 3/8 x 14 inches (289 x 356 mm). A fine, fresh impression, on cream Japan, with full margins (1 1/4 to 2 inches). Slight surface soiling in the margins, otherwise in excellent condition. Borne, 1980. Edition not stated. Signed Mortimer Borne Imp. in pencil. 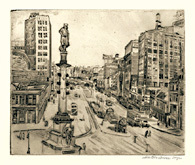 Titled Columbus Circle (small) 1938 in pencil, lower center margin. 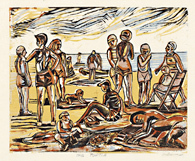 Image size 6 15/16 x 8 3/8 inches (176 x 213 mm); sheet size 8 3/4 x 11 inches (222 x 279 mm). A fine impression with rich burr and selective plate tone, with full margins (3/4 to 1 3/8 inches) on off-white laid paper, in excellent condition. 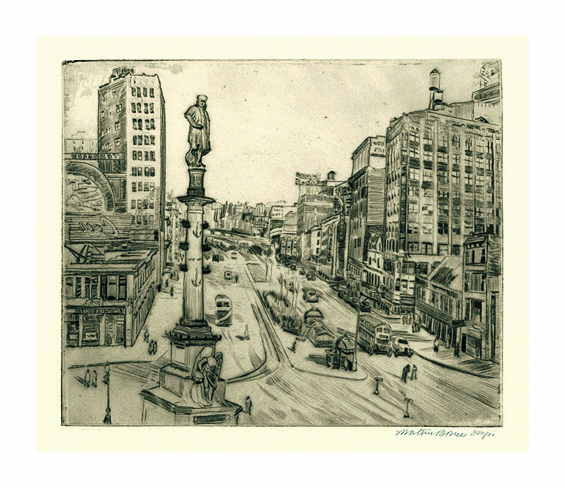 The plate was etched on location producing a mirror image of Columbus Circle, Broadway and 57th Street. Illustrated in Borne: Drypoints, Etchings, Color Drypoints, text by R. S. Biran, New York: Abaris Books, 1980.